Groningen, the Netherlands – July 12, 2013. The Diab-spot clinical validation study has recently been published in PLOS one. In this paper Diab-spot is compared with FPG (Fasting Plasma Glucose), HbA1c and questionnaires for diabetes screening. The authors conclude that Diab-spot is superior to FPG and non-inferior to HbA1c to detect (pre)diabetes in intermediate risk persons. 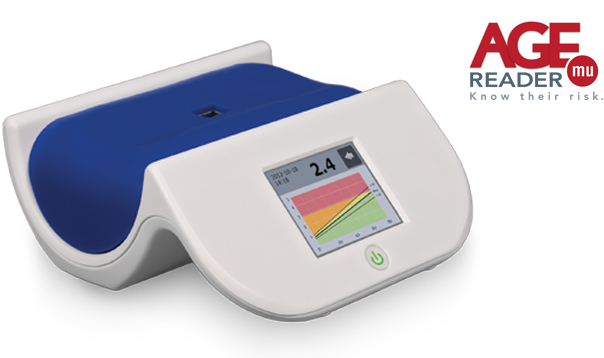 DiagnOptics was the first company worldwide to introduce a technology to noninvasively measure the tissue accumulation of AGEs by means of fluorescence techniques (AGE Reader). Diab-spot features this AGE measurement and combines this with a small number of patient characteristics to calculate the Diab-spot test result. These simple characteristics include questions about other well-known diabetes risk factors , which can be easily answered on the touch screen. Diab-spot yields an immediate screening result on the spot. Diab-spot is a non-invasive test that takes less than a minute to get a result. This allows for easy and quick pre-screening of people at increased risk of developing diabetes. The full text version of this publication is available at no costs. A link to the full text version can be found in the section with information for professionals.